The Hitachi 18V Brushless Band Saw makes a very respectable effort in the middle-depth range of cordless, portable band saws. It excels in smooth, easy cuts but could use a couple of improvements. Although we’re often impressed by the latest and greatest technology, there’s something charming about a design that stands the test of time. The spirit – or bubble – level comes to mind, basically unchanged from the mid-1600s. It’s an idea so good that not even the industrial revolution and inevitable march of technology could replace it. It’s cool to think that you’re working just as craftsmen and tradesmen have worked for hundreds of years. Not quite as old, but perhaps just as impressive, is the band saw. The earliest known conception came in 1808 and practical use started half a century later. It’s simple but ingenious: a thin, continuous blade under tension provides very smooth cuts with little friction. Technology has improved the original design such that the band saw is now cordless and portable. Today, we’ll get Hitachi’s take on the tool with the Hitachi 18V Brushless Band Saw. You can think of a band saw as an endless hacksaw. But to achieve a band saw’s endlessness, the saw pulls the blade across the material in one direction. Milwaukee secured its legacy in tool history with the motorized hacksaw in 1951 with what’s generally known as a reciprocating saw. But whether manual or motorized, the reciprocity of the hacksaw’s blade creates a jerky motion that by necessity can’t be as smooth as a band saw’s constant pulling motion. How smooth? Well, that’s what we’re about to find out. If there was any doubt, the term brushless in the name of the Hitachi 18V Brushless Band Saw refers to the motor’s design. Regular readers will know that brushless motors offer benefits – like longer life and overload protection – that brushed motors don’t offer. Thanks to the electronic controls a brushless motor requires, Hitachi adds a couple of other benefits attached to them with a soft start and overload protection. A soft-start function improves a users control of the tool as the trigger’s pulled. There’s an ambidextrous safety switch although the saw certainly favors right-handers (more on that later). The trigger isn’t variable speed, however, a speed dial allows the user to select among six speed modes. Modes 1 through 5 adjust the blade’s speed from 260 to 640 SFPM (Surface Feet Per Minute) and an Auto Mode automatically adjusts from 395 to 640 SFPM. Hitachi claims this doesn’t use as much battery power and also reduces the noise. The Hitachi 18V Brushless Band Saw blade measures 35-7/16- x 1/2- x 0.020-inches and are described as high-performance. No tools are required to change the blade, just an adjustment of the Quick Tension Lever and opening both hatches of the plastic body. An adjustable guide plate requires loosening two screws with the onboard Allen wrench. Cutting capacity is roughly mid-range for its peer group at 3-1/4-inch external diameter for round materials and 3-1/8-inch for square materials. As the features suggest, the band saw is designed for cutting conduit pipes, steel pipes, power cables, aluminum frames, and plastics. I suspect the Hitachi 18V Brushless Band Saw will be easy to operate with one hand as it only weighs about 6.5 pounds bare. Even so, it has a removable side handle that complements its elastomer-coated main handle for two-handed operation. There’s a bright LED work light and an onboard battery indicator because Hitachi’s batteries don’t feature gauges on the packs. This isn’t unheard of, but it does require the user to put a battery in a tool in order to see the discharge status. And don’t expect to get too much detail with the status – there are only two battery indicator lights instead of a more common three or four. I used the Hitachi 18V Brushless Band Saw on several one-off pipe cuts but then on a larger job where I cut all thread all day for hanging sewer pipe in the basement of a large church. Well, it might not be Barbara Streisand’s voice, but the Hitachi 18V Brushless Band Saw is like buttah (for you 1990s SNL fans!). It was just smooth as silk as it cut through the metal. You simply don’t get all the chatter that’s part of using a reciprocating saw. It’s quick and easy. But the advantages go even further. It’s easy to use the saw over your head with one hand – something you’re not likely to do (safely or wisely, at least) with a full size reciprocating saw. Sure, there are some one-handed recip saws nowadays, but you’d still get the chatter. The Hitachi is steady and smooth no matter what. I mentioned earlier that the safety is ambidextrous but the saw is for right-handers. That’s due to the placement of the removable, auxiliary handle which necessarily puts the trigger in the right hand and handle in the left hand. But of course, if you’re in a position to use it one-handed, a lefty can probably use it just as well as a righty. 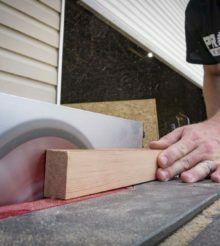 For as much as it’s easier to use the band saw in place of the reciprocating saw, you might run into the problem of space. The band saw’s large frame – like all handheld band saws – prevents the blade from reaching all the places that the recip saw can get to. And speaking of the frame, the major concern I have is what appears to be the vulnerability of the Hitachi’s plastic frame that houses the blade. As other reviewers have pointed out, the materials keep the weight low but do they set it up for failure over time? We’ll just have to see. In the meantime, I feel like I needed to be mindful of how I set the tool down and stored it. Of course, that’s not a bad idea no matter how beefy the tool, but you still don’t want to worry about it. Other things equal, however, I’d grab the Hitachi 18V Brushless Band Saw before the recip saw. The battery lasts all day, too, which is a bonus despite the shortcomings of the onboard fuel gauge. The Hitachi 18V Brushless Band Saw makes a very respectable effort in the middle-depth range of cordless, portable band saws. It excels in smooth, easy cuts in pipe up to about 3-1/4-inches and other materials like threaded rod. It could use some improvement with more LEDs on the onboard battery gauge and the durability of the plastic blade housing, even it means adding slightly to the weight. I’d also like to see a true variable speed trigger, although the variable speed dial works well and Auto Mode is helpful. At $249 for the bare tool, Hitachi just might entice folks already on its 18V platform deeper into its line. It’s in the middle of the road with both less and more expensive models available among major manufacturers. Will it make those who’ve yet to adopt the platform take another look? With the strength of some of Hitachi’s other 18V tools – like the triple hammer impact driver and cordless finish nailers – I think it could.